You moisturize religiously, but your knees and elbows (and sometimes your ankles!) are still very thick and dry. What’s the problem, and how do you finally solve it? Why do we get dry elbows and knees? The skin in these areas are different from the skin on the rest of our arms and legs. It has less sebaceous glands (which secrete oil) and produce less lipids that help moisturize the top skin layer. Hormonal changes, hereditary conditions like eczema, and health conditions like diabetes or thyroid problems can also dry out the skin. But in most cases, dry knees and elbows are caused by our own unconscious habits. Skin gets thicker from friction. Watch out for these habits: resting elbows on the table, sitting cross-legged on the floor, or tight-fitting jeans that rub against the knees. Here’s how to soften and smoothen dry knees, elbows and ankles. 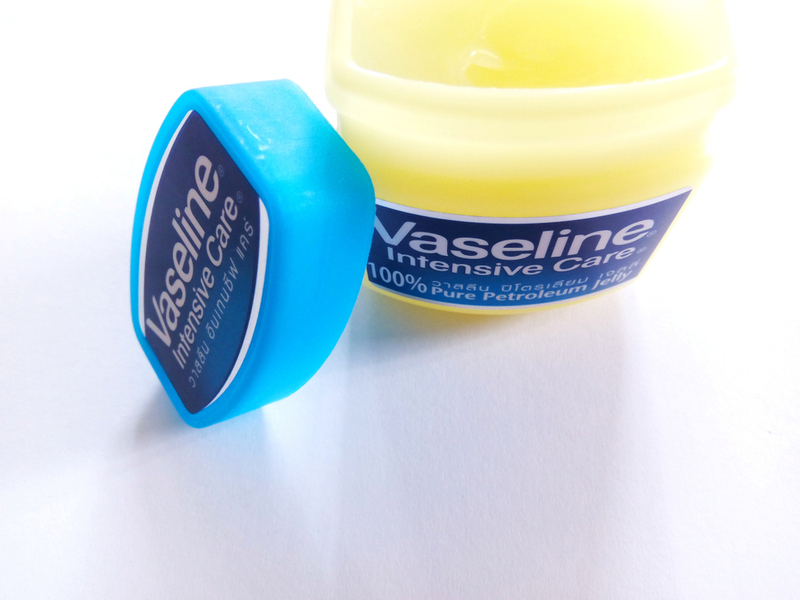 Petroleum jelly works miracles on very dry, scaly skin. Just apply a thick layer on your elbows, knees and ankles right after taking your evening shower. It locks in the moisture from your bath, and since you’re asleep you won’t mind the greasy feeling. 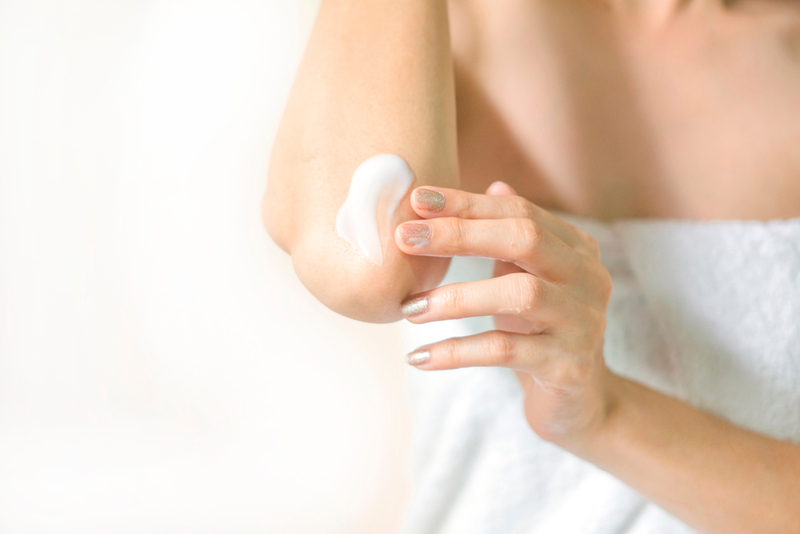 Your thin, light body lotions won’t work on really thick and dry elbows and knees. Look for very creams and body butters, which are able to penetrate the rough skin and work their magic. Keep a travel-sized bottle of heavy lotion or a mini jar of petroleum jelly in your bag or office drawer so you can moisturize regularly throughout the day. Make it a habit to rub some of that uber-moisturizing cream into your elbows, knees or ankles whenever you’re taking a break. You can even keep it by your computer keyboard, so while you waiting for a website page to load or mentally compose an email, you can give your dry spots a little extra TLC. Sunscreen (especially those that contain anti-pigmentation or whitening ingredients) can prevent dry elbows, knees and ankles from darkening. Very abrasive scrubs or going heavy-handed with pumice stones won’t make your elbows, ankles or knees smoother. You may even get the opposite effect: you’ll damage the skin, so your body toughens it up like a callous to protect it from further injury. It’s better to just gently exfoliate everyday instead of attacking it once a week. Use a loofah or wash cloth and a body wash with microbeads or chemical exfoliants like lactic acid. If you can’t break the habit of placing elbows on the table or sitting on the floor, then at least pad the surface. Sit on a large throw pillow, or fold a small towel for your elbows to rest on while you type at your computer.